Why do we need street vases for flowers? There are several reasons. First, they facilitate the work of the gardener. 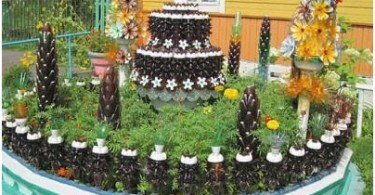 They can grow all kinds of plants, even the most capricious, who do not like transplanting and require special composition of the soil. Secondly, flowers in pots and planters to easily move to the desired location, or to protect from the rain and cold. 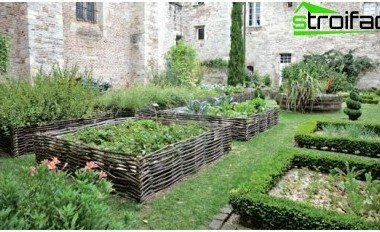 But most importantly, the use of containers helps to decorate stairs and terraces, patios and garden paths, as well as other places where the soil is not in principle. 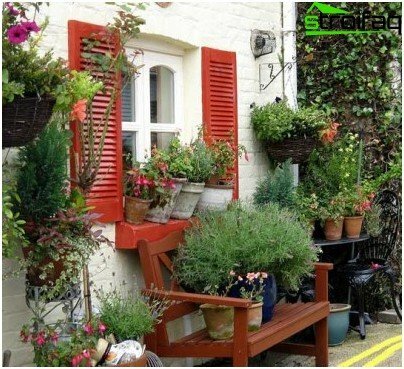 Even the most modest courtyard, where there is notiles and unique plants, flowerpots can play an indispensable role. 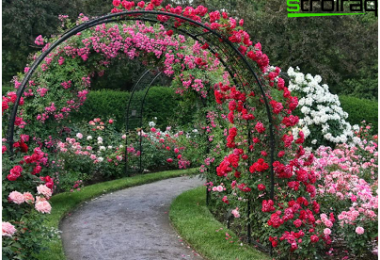 Growing flowers in them will make your garden more colorful and unusual. What do I need? Just make bright accents in the right places! In this article we will examine the main criteria by which you can select the appropriate vases for flowers, which would become a decoration to your territory. When choosing the size of the flowerpot, remember thismoment as proportionality. Pot should correspond to the value of the site and harmoniously fit into the existing space. 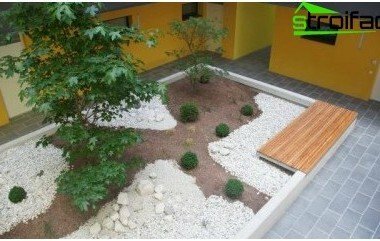 For example, if the area of ​​the yard is not too big, it is not necessary to place it on a large container with flowers. It is unlikely that he will make it extra comfort! Rather, dominating everything else, it will look awkward and intrusive. The opposite effect - is when a small pot is lost and becomes invisible on the widest and longest avenue. 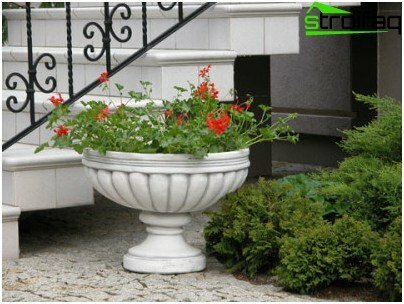 What is the function of the flower pots? They should emphasize the beauty and uniqueness of the plants planted in them. Therefore, plastic pots for flowers, or made of other materials are not to be bright and colorful. Thus the frame may be richer in the picture itself. 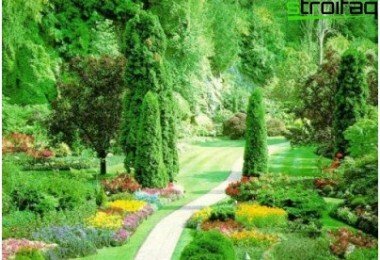 That is why in the landscape design is dominated by white, terracotta, beige, cream and brown colors, as well as delicate pastel shades vases. Such products can be made from anatural and artificial materials. In the first case, it is a stone, clay, metal, china. It relates not natural concrete and plastic. All of them have both advantages and disadvantages, which we discuss below. Such individual elegant vases asusually made-to-order and are therefore considered expensive. They are monumental tower on its pedestal and are designed to emphasize the status of the host building. Their undeniable merits - it is extraordinary durability and decorative effect, which can be increased by several times, making a textured pattern on the surface. 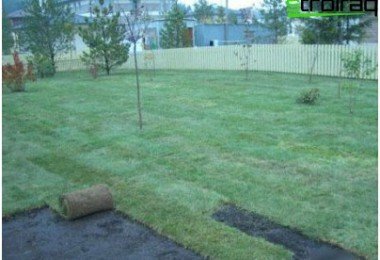 They perfectly retain water and do not allow to dry ground. They have the same value as the product ofstone, concrete can be considered as artificial stone. This material is cheaper and therefore received more recognition. 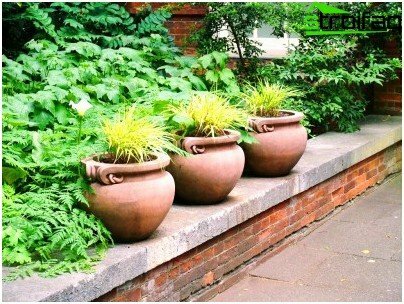 The soil in these pots for a long time retains moisture, which is particularly important during the hot summer. Concrete perfectly capable of not too too hot during the day and cool not very fast at night. A significant drawback of the stone vases(Natural and artificial) - their severity. Due to the heavy weight they are difficult to carry from one place to another, often making it impossible to change the garden scenery. The main advantage of which are plasticvases for flowers - an affordable price and low weight. The achievements of modern chemical industry allow you to create a plastic that looks like a natural material - clay, stone, etc. At a great distance the difference is quite difficult between them. Such pots and the pots are well able to retain moisture, not allowing the roots to dry out the plants. It is very important for the water-loving flowers. This natural material is uniqueplastic. It allows you to create a product of very different forms. 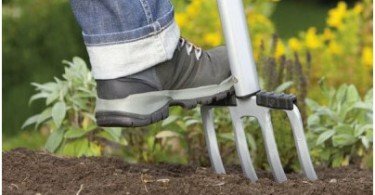 Due to its high porosity, the soil in the pots naturally saturated with oxygen, which has a positive effect on the root system and the further growth of plants. The downside is that such a makeshift factory and flower pots have a porous structure of the material. As a consequence, there is a rapid drying of the soil, so the pots can not be placed in direct sunlight. It does not apply to products covered by glaze. All these disadvantages have reduced to zero, but there was negative - the roots can not get supplemental oxygen. Decoration of the site is notbe sure to use ready-made pots and planters. They may look even more original if you make them with your hands. Moreover, in the case will go to the most unexpected materials - wooden barrels, boxes, wheelbarrows, carts, etc. Wood perfectly retains moisture and is therefore the best option for moisture-loving plants. Having made such pots for flowers with his own hands, do not forget to cover them with lacquer or varnish. So your "creation" will not lose decorative properties even after heavy rains. 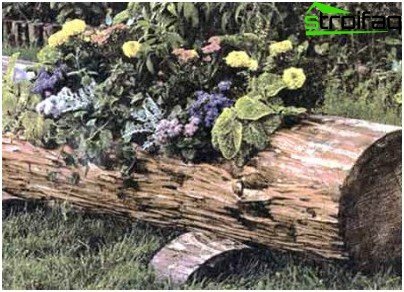 An excellent option for planting flowers can become an ordinary stump. The inside of the timber is removed and the void is filled with soil and planted it in the plant. As a material for the improvised flowerpotsmany people use plastic bottles. Their top of the clip, and at the bottom make a few holes for water drainage. Options how to decorate a pot, can be a lot - it all depends on your imagination. It can be funny little animals painted or glued plastic flowers and butterflies. Located on the street planters should bringAttention. But this does not mean that it necessarily is given the place of honor. 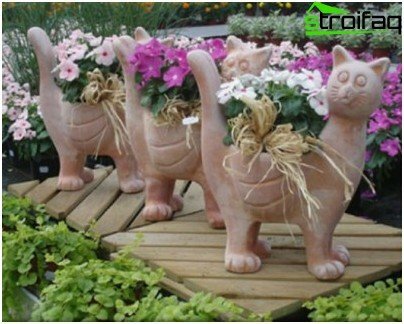 This is possible when the pots for flowers made of concrete placed in the central part of the flower beds. In other cases, their place - this is the edge of the tracks, paths, porches, stairs. Remember that flower pots and planters create with a purpose! This goal - to bring to the design of a spectacular area "flavor". We hope that you will succeed!